1-Indicates Devices with Higher than 1.0 Amp Current. - For any male-connector application contact sales office. A bias tee is a network that consists of three ports. RFin input port is used for the RF signal, DC port is used for the DC voltage and RF+DC port is the output of the bias tee that combines RFin and DC. 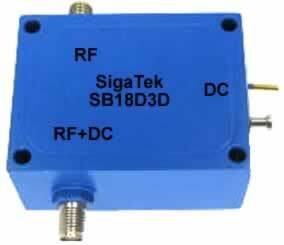 These networks are used for delivering DC voltage to some electronic components without disturbing other components. 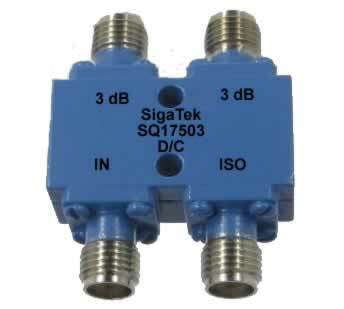 For example biasing an antenna amplifier which is positioned at the receiving end of the coaxial cable to pass DC power from an external source thru the coaxial cable to the amplifier. 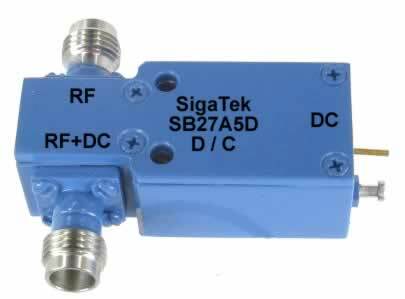 The bias tee networks can also be used as diplexers. 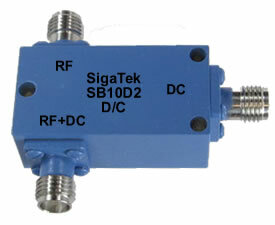 The signals on RFin port and DC port occupy different frequency bands. 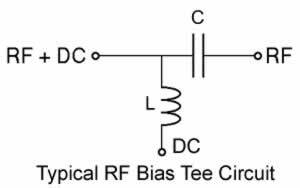 The low frequency port or DC port is used to set the bias of a specific device where the high frequency port RFin passes the radio frequency signals but blocks the biasing levels. 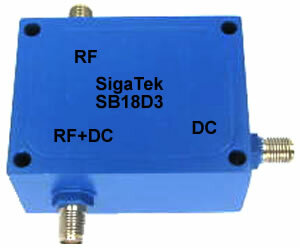 The combined port connects to the device, which sees both the bias signal and the RF signal. 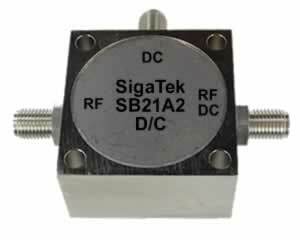 Other applications are biasing laser diodes, photodiodes and optical modulators with a bias current or bias voltage while wideband RF signals can pass through with a minimum signal degratation. 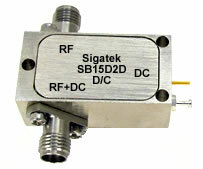 SigaTek offers a variety of broadband RF bias tees, networks that cover the frequency range of 30 Khz to 80 Ghz. 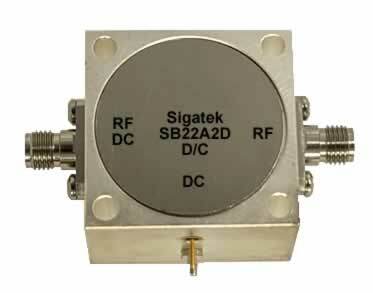 Individual devices are designed for optical networking applications and can cover frequency bands from 30 Khz to 40 Ghz, 30 Khz to 65 Ghz and 30 Khz to 80 Ghz . 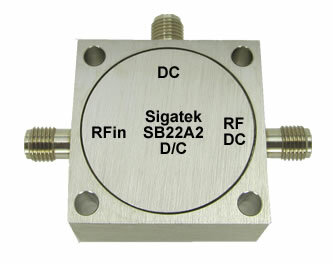 These wideband RF bias tees, networks offer high isolation up to 40 dB with excellent VSWR, low insertion loss and high current handling up to 6 amps(custom designed). Voltage rating can be as high as 250 Vdc (custom designed). 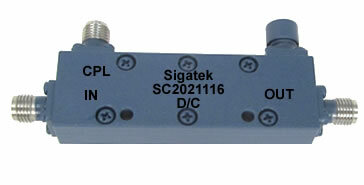 A selection of input and output connector options are available. 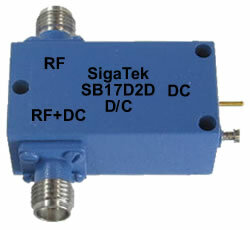 Also, the DC port can be a RF connector or a DC pin. 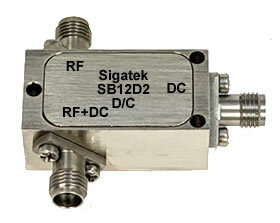 Bias Tee covering frequency range 5 Mhz-12.4 Ghz. 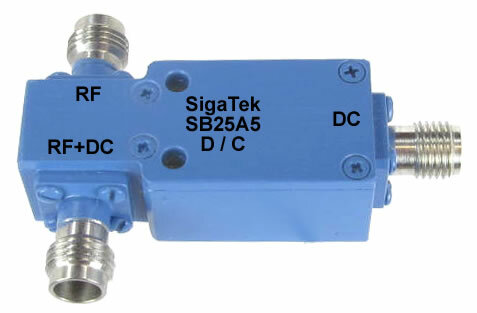 Connectors RFin port SMA female, RFout port SMA female and DC port SMA female. Handling current is 1.5 Amps and voltage is 25 Vdc.